Whether you’re looking for a vintage leather coat, an old Elvis record or fresh produce to cook up for dinner, a trip to San Telmo isn’t complete without taking a stroll through the Mercado de San Telmo. Located between the streets of Defensa, Bolívar, Estados Unidos and Carlos Calvo, the San Telmo Market was built in 1897, to serve as a large, centralized fruit and vegetable market. The Tuscan-style building, constructed by the prolific Italian architect, Juan A. Buschiazzo, has a beautiful interior structure with a wrought iron and glass atrium. At the time, it was the first private market and of its kind in the area and it helped to secure San Telmo’s reputation as a fashionable and convenient place to live for wealthy residents. Today there’s not just produce to peruse but antiques, second-hand clothes and curiosities. To the dismay of shopkeepers, the market is not as central to the social fabric of the neighborhood as it once was — it is often quite dead during the week, but it does get busier on weekends, especially when tourists visiting the nearby San Telmo Antiques Fair stroll through. The produce here is usually of very high quality, although the prices tend to have a gringo-mark-up that makes them a bit higher than neighborhood vegetable stands outside of the market. Coffee lovers needing a jolt after a long flight won’t want to miss the Coffee Town stand, which offers high quality free trade coffee that will put the local cafeterias to shame. Those shopping for non-perishable goods will discover classic tin plates and posters, odd antiques and furniture, used leather jackets and funky hats. 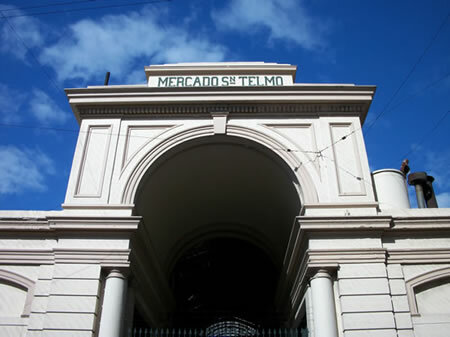 The San Telmo Market is open every day of the week from 10 a.m. until sundown, although each stall has their own hours. • Hours: 10 a.m.—8 p.m.